A friend gave me the old Rolodex she had on her office desk. No one uses these antiques anymore. 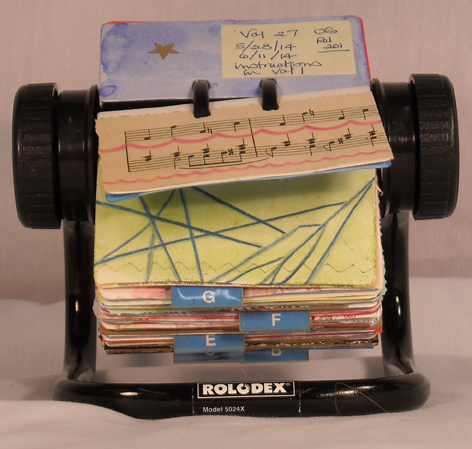 It sat in my studio for several months when the inspiration struck to use the Rolodex cards to create small works of art. It was such an innocent start, just a card or two when I was waiting for paint to dry. Then when I had some extra collage material I glued it to a card. All these little bits and pieces started to become an obsession. I cut up photographs, then monoprints, I painted with watercolours, then used felt pens, attached stamps, maps, pages from books, and handmade paper. I did quick drawings and even more collages. Coloured pencils, scissors, and glue sticks littered my workspace. Before long I had over 200 of these little cards! Then it was time to place the cards back on the Rolodex. I arranged the cards to create an endless variety of colours and media. I happily scrolled through my 200 little pieces of art. No office desk would ever suffer from boredom again!! !